​Click [HERE] to learn taiji and qigong with me, privately or as part of your coaching experience! Below are an excellent introductory video instructing how to perform the 8 Brocades (Treasures) Qigong Practice by Mimi Kuo-Deemer, as well as a great 7-video Tai Chi for Beginners Course by Dr. Daniel Hoover. Enjoy and practice on your own at home! Taiji/Qigong is an ancient Chinese art that is several thousand years old. "Qigong" literally means "energy work" and involves moving the body slowly and gracefully, in harmony with the breath and mind, to increase and improve energy flow through the body. The direct results of regular qigong practice are increased overall energy, increased vitality, relaxation & stress relief, improved operation of all organ systems, improved blood flow and normalization of body temperature, relief of muscle and joint pain, increased flexibility-balance-strength, improved elimination, and improved mental clarity and focus. Long terms effects of qigong practice are increased longevity and healthspan...meaning you will look and stay younger longer! I have been practicing qigong regularly for over 20 years, and I am a testimony to that. Taiji is a relative of qigong, having been developed initially as a very powerful martial art, harnessing the internal energy of the body and learning to project it outwards to attack and defend against an opponent. 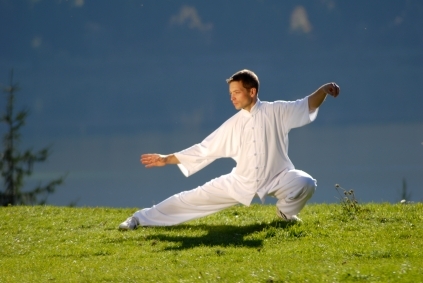 Today, taiji is practiced by most people as a healing method, indistinguishable from qigong. As part of its martial heritage, many of the movements of taiji including punches and kicks, and there are separate entire forms dedicated to various weapons, primarily swords. 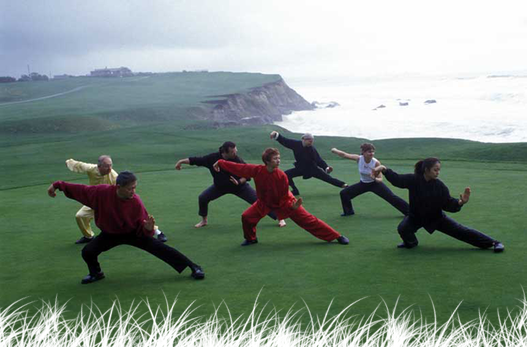 There are many styles of taiqi & qigong, and the style I have the most experience in is the Yang family style. I have studied with the Tai Chi Tao Center under Master Waysun Liao and received certification more recently from Master Jesse Tsao and Tai Chi Healthways. Watch me perform the complete Yang Family Style Taiqiquan and some associated Qigong forms, as taught to me by Grandmaster Waysun Liao, author of the "Bible" of Taijiquan, his famous book "Tai Chi Classics."